Virginia bluebells (Mertensia virginica) are nothing less than the royalty of spring ephemerals. Large, showy, and colorful, they put on one of the very best spectacles of any spring blooming plant, with all the rich costuming you’d expect in the court of a queen. Virginia bluebells break ground very early in spring. Their tightly furled leaves look like tiny burgundy cabbages when they first emerge, but as they grow they quickly morph into medium green, fleshy oblongs that resemble the leafy green vegetable sorrel. Seemingly in no time they produce profuse clusters of dangling blue bell-shaped flowers on 18″ stems, blooming for several weeks in May. (They also come in a white-flowered form that is uncommon but possible to find.) Once flowering ceases, and almost before you have time to notice, they close up shop. Their leaves yellow rapidly, and the plants have gone completely dormant by mid June. They’ll spend the remainder of the year as inscrutable, seemingly dead but really just dormant roots nestled just below the soil surface. Incredibly, their entire aboveground life cycle is barely two months long. The sheer rapidity of their growth and “demise” along with their large size and showiness make Virginia bluebells very border friendly. Their leaves do not need to hang around the garden for months to store enough energy to ensure flowering the following year. They put on their spectacular display and then vanish—a gardener’s dream! 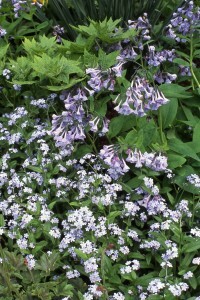 Virginia bluebells are excellent interplanted with other blue-flowering plants such as perennial woodland phlox (Phlox divaricata). This phlox flowers just as the bluebells fade, so the segue from one to the other is seamless, and because the phlox spreads into a non-competitive groundcover, the bluebells will continue to arise through the mat of phlox foliage year after year. Biennial forget-me-not (Myosotis sylvatica) also makes a great companion, as shown in the photo above. Virginia bluebells’ sky blue flowers are also an effective counterpoint to yellow daffodils. Gardeners with borders in both sun and shade can take best advantage of this artful duo, planting the sunny areas with clumps of daffodils and the shady ones with masses of bluebells. The result will be breathtaking! Another natural companion is old-fashioned bleeding heart, whose brilliant pink or clean white flowers reach their peak simultaneously with those of Virginia bluebells, although the latter plant will go dormant months before the former. If you try this combination, use hostas, ferns or other late-emerging plants to fill in the areas occupied by the bluebells in May. 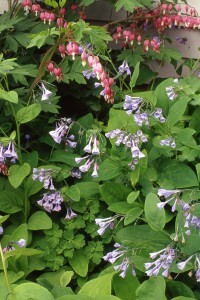 Virginia bluebells spread readily by seed, moving outward from an original planting at a speed of a foot or two a year. In autumn, be careful working in the parts of your garden where bluebells are established, since it is so easy to dig into and accidentally destroy dormant roots at that time of year. It’s not too late to have Virginia bluebells this year. Nurseries often stock them in April and early May since they’re one of the few plants that can be sold in full bloom at such a chilly time of year. Bloom times and other life cycle stats are accurate for northwest Connecticut. In milder areas all aspects of a plant’s life cycle may occur earlier in the year, and in colder areas, later. March, 2010: Update! 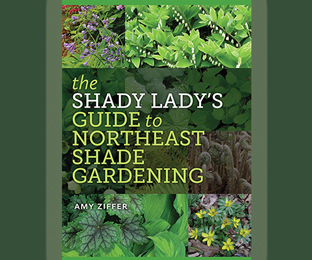 The good folks at GardenSMART took a shine to this article and reprinted it at their website. You’ll find this post (and many other interesting items) in the Articles section.